If you haven’t picked up Morning Star yet but you are reading this review, chances are you’re probably wondering if I think this final volume is worth reading—a question to which I can provide a definitive answer. Now that that’s out of the way, I will proceed with the rest of my review, which I’ve gone to great lengths to keep as vague as possible and spoiler-free. Regardless, if you’d rather avoid all coverage of this novel until you’ve read it for yourself, I totally get that too. Believe me, no one understands more than I do the importance of heading into a book with the freshest eyes possible, especially when it comes to this series. I went into Red Rising and Golden Son completely blind, and I was glad that I did. Both times I experienced some very raw, very visceral emotions, precisely because I did not know what to expect at all, and I wouldn’t have traded those first reactions for anything. Arguably, that explosion already happened at the end of Golden Son. What I experienced in those final scenes, I don’t think anything can come close to ever again, so personally speaking I still have to give the ultimate edge to book two. Coming in hard on its heels though, Morning Star nonetheless fared extremely well, considering the sky-high expectations. It had its fair share of unforgettable moments, delivering a brilliant climax and conclusion that I’m sure will leave many stunned and speechless. However, unlike my time with the previous book, I couldn’t help but feel that the emotional high upon finishing this one was more fleeting and just a tad less intense. After a couple hours of being left to my thoughts, I think part of the issue is because…I can see right through you now, Pierce Brown. In essence, the author has reused some of the same tactics out of his Golden Son playbook. 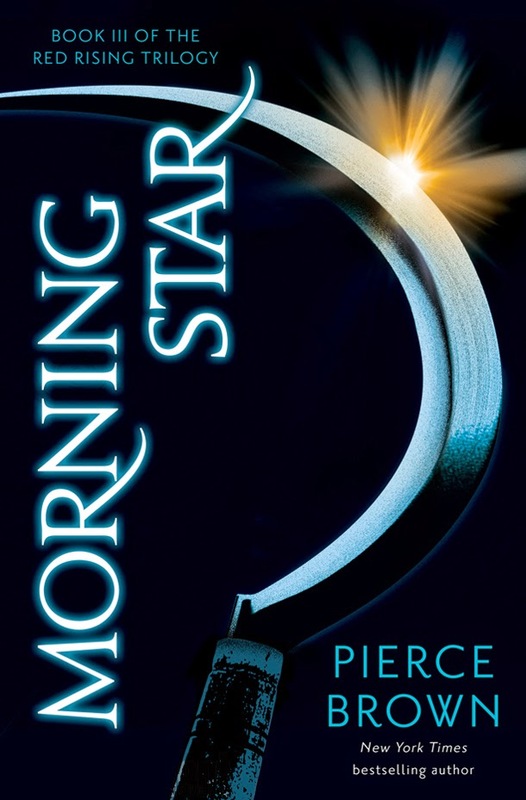 But after the way the last novel made a mess out of my feelings, I will admit I went into Morning Star with a much clearer head and was immediately on alert for any tricks or red herrings. Perhaps I wouldn’t have found the story quite as predictable if I hadn’t, but going in blind didn’t make much of a difference for me this time around. It wouldn’t have changed the fact there were a couple glaring inconsistencies and some heavy-handed foreshadowing that led me to guess exactly how things were going to play out, so it didn’t surprise me when this affected my overall impression of the novel. However, putting the entire journey in perspective, the Red Rising trilogy is a truly epic saga that can’t be beat. I said it at the beginning of this review and I’ll say it again: Read these books, they are so worth it. I cannot remember the last time a series has put me through the wringer like this, playing with my emotions like a fiddle. I still remember my first taste of the author’s writing and being amazed at the beauty and emotion in his prose. He will likely break your heart in Morning Star, but rest assured, like the previous books in the series, this concluding volume is also filled with equal parts pain and triumph. Despite the circumstances that mitigated its full effect on me, I still loved the hell out of this book. It’s a damn-near-perfect ending, and I closed the cover on the final page filled with glowing sense of hope. The trilogy may be over, but I for one cannot wait to see where Pierce Brown’s talents will take us next. I am, hopefully, gonna start Golden Son next week, so that I can get to this! Awesome! You must borrow it! I’ve been hearing so many spectacular things about this series. I’m glad to hear that it ends on a high note. I’ll have to start it soon. Yay! And now that the whole trilogy is out, you can read interrupted! It was such a long wait for this conclusion, especially since I was so hooked after the end of book two, lol! He definitely broke my heart. I just finished Morning Star and I’m still distraught over Ragnar.